The Dutch government is currently focusing on autonomous technologies. Autonomous cars can already be found on Dutch highways and now Rijkswaterstaat (The Ministry of Infrastructure and Water Management) has also started to automate survey processes on rivers, together with the company Aquatic Drones. The use of autonomous vehicles creates new opportunities for traditional surveys. Equipped with hydrographic instruments, the vehicles can collect data remotely in increasing volumes, in challenging environments and with less risk to personnel. One of the challenges will be the quantity of the data collected and having to post-process it. Traditional methods with acquisition and post-processing software will have to be abandoned. The data coming directly from the multibeam or side-scan sonar can be directly entered into the processing software, without the need of acquisition software. Aquatic Drones together with Teledyne CARIS and partners carried out a successful pilot for Rijkswaterstaat on the River IJssel in the Netherlands, demonstrating the capabilities of ASVs and new solutions for autonomous processing. The aquatic drone was equipped with Teledyne CARIS Onboard, Teledyne Reson T-20P, Teledyne Reson PDS, Ixblue Phins and Septentrio AsteRx-U GNSS systems from Navigation Solutions. The survey systems offsets were accurately measured by Star Mountain. PDS was mainly responsible for the line planning, while CARIS Onboard took care of the innovative way of processing. Communication for the controls of the aquatic drone and CARIS Onboard data transmission was made possible by a regular 3G / 4G cellular network from T-Mobile. Geospatial data for the area around Doesburg was downloaded from the Dutch national PDOK website to enable mission planning and for live analyses during the survey mission. The Dutch National Spatial Data Iinfrastructure (PDOK) is a central facility for unlocking geo-datasets of national importance. This is up-to-date and reliable geospatial data for both the public and private sectors. Prior to the survey a processing workflow was defined and uploaded to CARIS Onboard. The user can define its own processing workflow based on the needs of the survey project and can even alter the workflow during the mission where needed. The settings were remotely uploaded to the aquatic drone using the CARIS Onboard geospatial Web App. The workflows are based on the known CARIS HIPS and SIPS Processes. The platform used for the mission was provided by Aquatic Drones. The aquatic drone is designed in such a way that the platform can be used as a multi-purpose drone. 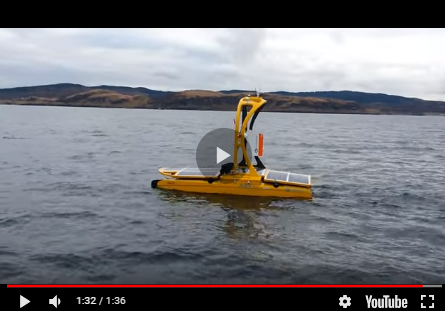 In addition to the pilot multibeam survey, the aquatic drone also carried out sub-bottom surveys to identify Unidentified Explosives and can be tailored to host other sensors as well. The USV has a twin hull and has a large cargo bay to house the hardware for the controls of the sensors. The aquatic drone can survey for about 12 hours before a battery has to be changed and is capable of sailing in strong river currents. The Reson T20-P was installed between the two hulls for this particular mission. In order to perform the mission and to ensure safety, Aquatic Drones designed and integrated a sophisticated obstacle avoidance technology. The survey location and demonstration to Rijkswaterstaat was performed on the River IJssel near Doesburg, The Netherlands. The River IJsel is a major Dutch river that is about 125km long and 70 metres wide. The aquatic drone surveyed the River Ijssel for approximately 6 hours. The aquatic drone performed very well in the challenging environment. Despite the strong currents and suction currents in this sizeable river, the aquatic drone easily managed to sail for these 6 hours and also maintained its speed upstream. Aquatic Drones with multibeam survey suite. Once CARIS Onboard received the processing workflow, the software automatically carried out the processing according to the defined workflow. In this particular case the processing workflow was designed to process the bathymetry of the S7K datasets coming from the Reson T20-P, although it is possible that the normalised backscatter from the Reson T20-P was not processed for this exercise by CARIS Onboard. When manually steering a vessel one needs to see instantaneous coverage of the survey area, with autonomous surveys this is not specifically required. Therefore, data can be directly ingested from the multibeam sensor into CARIS Onboard. Once CARIS Onboard finalised the first survey line on the River IJssel , the grid was made available to the CARIS web-service on the survey platform. Each subsequent survey line was then automatically processed and added to the gridded surface, resulting in a complete surface. The processed grid was live streamed to CARIS Onboard’s WebMap making it available over the internet to the people onshore in Doesburg as well as in the CARIS office in the Netherlands. The traditional methods for transmitting survey results from a ASV are often carried out through a regular file transfer. Due to the increasing raw data volumes, this can be constrained by the cost and availability of bandwidth. This problem becomes even worse for daily, intensive surveys and becomes cost inhibitive. In addition to compressing the raw data down to a processed surface, CARIS Onboard makes use of the CSAR gridding technique, which is based on the quad tree principle. The CSAR gridding method makes it possible to transmit data to anyone, without transferring the whole dataset. You then transmit per package of data in the order of kilobites rather than the Gigabytes when transmitting the whole dataset. Live 3D multibeam data from Onboard in HIPS and SIPS. During the preparation of the demonstration in Zeeland, the Netherlands, the coverage provided by the telecom provider was not ideal. Nevertheless, the CSAR technology was still able, with speeds of as little as 1 Mbit, to visualise the data in the CARIS office. In addition, by publishing the data to a WebMap, CARIS Onboard allows multiple users to interact independently with the live-stream, which is clearly an advantage over remote desktop control (e.g. TeamViewer) which only allows a single user to control the screen. During the survey, the processed results were visualised through a web portal. Furthermore, the processed data was opened in the desktop products CARIS Easy View and CARIS HIPS and SIPS. In these applications the data could be compared to the available legacy data and other available spatial data. In the CARIS office, a difference grid was calculated instantaneously between the incoming data and the legacy data. The interesting prospect for Autonomous Surface Vehicles is that they have the potential to work in groups or so called swarms. The first concepts where multiple ASVs are used during a survey in combination with manned vessel are already available. Aquatic Drones also has the potential to grow towards surveying in groups. The acquisition costs and the operational costs of ASVs are relatively less expensive than a manned survey vessel, where the difference increases the larger the survey vessel. Using ASVs for surveying tasks will challenge organisations for processing. In order to remain efficient, CARIS Onboard can process the data for multiple drones. In the end, the hydrographic expert will maintain and oversee a fleet of ASVs while performing the final quality checks on the data. Although the post-processing was not carried out for the demonstration, a user could still directly open the processed data in CARIS HIPS and SIPS afterwards. In cases, for example, where more accurate post-processed navigation data is available, better beam pattern correction for a mosaic is needed, or one would like to perform tidal correction in a different way, then the processed data is opened in CARIS HIPS and SIPS straight away and final edits can be made. Onboard Web-Portal with Processed Multibeam Data.